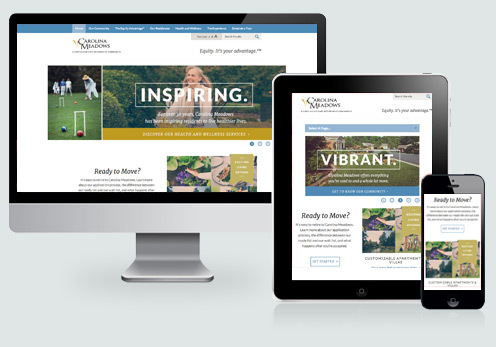 Carolina Meadows came to Rivers Agency with a challenge: To create an inspiring, smart, vibrant, enriching and extraordinary website design – just like their community of residents and staff. Before diving into the website project, we grounded our thinking through the development of a new brand, a comprehensive marketing plan and tons of research. Rivers Agency is proud to introduce the recently launched, fully redesigned website – CarolinaMeadows.org. Featuring unprecedented functionality and cutting-edge design in the Continuing Care Retirement Community (CCRC) sector, the new site celebrates the flourishing Chapel Hill community, serves as a resource for current residents and provides prospective residents an immersive view of Carolina Meadows. CarolinaMeadows.org features a fresh, youthful look that matches the active lifestyles of Carolina Meadows residents. Striking visuals showcase the community atmosphere and envelop users throughout their visit. The intuitive layout makes it easy to find information, and the most important content is just a click away. Potential residents can access a built-in floor plan finder to search for available apartments and villas by criteria such as square footage, number of bedrooms and bathrooms, and amenities such as dens, sunrooms and porches. The events calendar and delectable dining menus are updated daily and are easily edited through the Carolina Meadows resident portal, Meadowlife. In fact, with the built-in content management system, Carolina Meadows staff can easily create or edit any page on the website. This customizable experience will be of paramount importance as the Carolina Meadows community continues to grow. CarolinaMeadows.org is fully responsive, automatically adjusting across desktop, tablet and mobile devices, including Retina displays. The site features a text size tool allowing users to increase the website’s font size and avoid straining to read small text. It also includes multi-user blog that allows residents and staff to share the latest news and experiences from their community. The final result: A website that’s widely accessible to all audiences and reflects the exceptional nature of this vibrant community. As the fifth largest ad agency in North Carolina, Rivers Agency takes great pride in the work we do for clients. We are honored to be selected for this work, and we look forward to continuing our client relationship with Carolina Meadows. Congratulations to Lauren Rivers in the opening of her new Rivers Agency in downtown Chapel Hill. Much success in the future. Congrats to the whole Rivers team. You guys rock !